To vault means ‘to leap (ie, jump forward) from one place to another or over something.’ Figuratively, it means ‘to achieve something quickly,’ as though you have leapt past others or over obstacles to do so. A vault, as a noun, is the leap of a horse or any act of leaping in general. 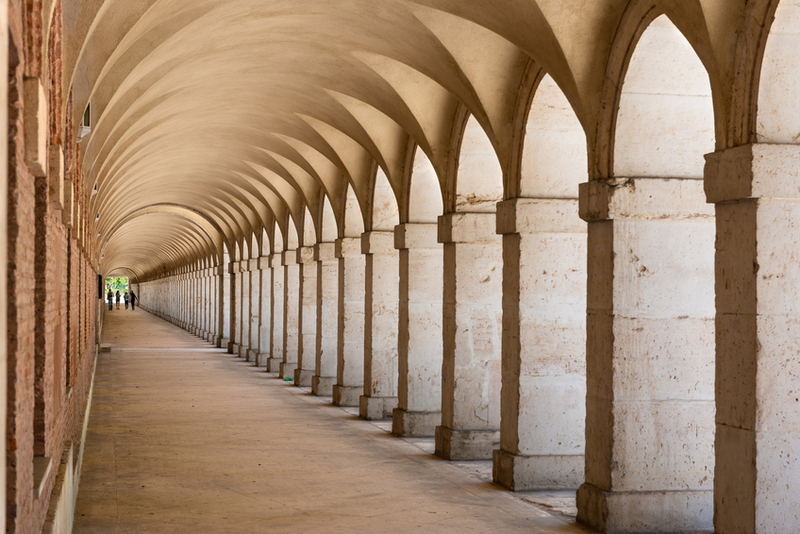 However, a vault is also an arched structure that forms a ceiling, as well as a space, usually an underground one, enclosed by a vault. A vault is a big room for keeping valuables or a burial chamber. The gymnast vaulted over the horse. The scientist vaulted to international fame after her amazing discovery. Neil's vault took him over the gate and into the field. Amber looked up at the impressive vault in the church. They've turned the vaults of that building into a wine bar. The bank's vault can only be accessed with a special code. Henry was buried in the family vault. Vault, as a verb meaning ‘to leap over something, especially using your hands or a pole,’ dates back to the early 16th century. It comes from the Old French vou(l)ter, volter, (to leap), which in turn comes from the Italian voltare (to turn or leap). The origin can be traced back to the Vulgar Latin volvitare, a derivative of the Latin verb volvere, ‘to turn.’ The noun, meaning ‘a leap,’ comes from the verb and first appeared in the late 16th century. The other sense of vault, ‘arched roof or ceiling,’ dates back to the year 1300, in the form of the Middle English noun voute or vaute. This meaning also comes from the Latin verb volvere, but in this case, from its past participle volutus, which meant ‘bowed or arched.’ The verb comes from the noun, and appeared in the late 14th century. The l in the spelling appeared around the year 1400, probably because the Latin form had one.